The Spinner Blade is a commercial grade spin bike that is a quality bike used in fitness clubs across the country. But just because it is good enough for the gym doesn’t mean it is right for use in the home. In our review we check out how it stacks up in terms of quality and use ability at home where there are some other considerations – such as noise and storage. It certainly looks the part. It has an aluminum frame, chain drive system, manual resistance and comes with 4 Spinning DVDs. Spinner do have some of the best bikes around and have been doing it for years so you’d expect the bike to be good and be tough enough to provide the basis for intense cardio workouts as well as moderate exercise. The first thing it needs to do is keep steady while you are riding it hard. The bike is made from cast and extruded aluminum which provides a solid base for your workouts. The aluminum makes for a lighter bike even though it still weighs 126 lbs. The quality of the build of the bike is still tough and durable even though it is built with aluminum rather than steel due in part to design of the taper fit bottom bracket providing more overall srength. When you are riding the bike it holds firm no matter the level of intensity you are cycling at. This is the same whether you are in the saddle or out of it or doing jumps. This leaves you to focus on your workouts and not wondering whether you’ll be tipped off. The bike has been designed to prevent rust that can be caused by sweat dropping on it. It also includes step and stretch guard to prevent damage from cleats. This all helps to keep it looking good and in top condition. User experience indicates that this bike lasts for a long time without any drop off in performance. So you can expect to get a lot of great workouts out of the bike for a good number of years. There is some maintenance recommended but it is minimal. This includes wiping the bike down after use to keep it clean from sweat, inspecting and tightening bolts as required, replacing resistance pads, and tightening and lubricating the chain. The flywheel weighs in at 46 lbs. It is perimeter weighted which provides the inertia to pull the pedals through the pedlaing motion when you are at the top/bottom of the cycle. this gives a realistic and fluid cycling motion that you find when riding an outdoor bike. It prevents any jerkiness and the feeling that you are in the wrong gear. This gives you a low impact workout that is easy on your joints. There are levelers under the stabilizer bars which even out the bike if you are using it on an uneven floor. This prevents and rocking you would otherwise experience. The bike is fully adjustable to fit people correctly between the heights of 4ft 10 ins and 6 ft 10 ins. You do this by using the adjustment pole and sliders to move the seat and handlebars horizontally and vertically to the right position. They are fixed in place by tightening the adjustment knobs fully. The pre-set holes in the vertical poles are close together so you can just about set them to the just the right position avoiding what you can find on some bikes where the holes an inch apart and resulting in a feeling the seat/handlebars either just too high or too low to fit comfortably. It takes less than a minute to make the adjustments to your personal settings once you have it set them for the first time. You can then quickly get on with your workout which is great especially if you are short for time as can happen in the mornings before work. Also, this makes it possible for more than one person to use it for their cardio workouts. The adjustment poles are marked so you know where to adjust the poles to. You can also mark the poles with a felt tip pen to help with this if you want. Resistance is provided by way of a pad that sits on the top of the flywheel. It is increased or decreased by using the tension knob on the top of the frame. It goes up in steady increments giving you a good range of resistance from easy to very difficult for all types of different hill climb workouts to build strength and endurance. Like most spin bikes there are no markings to give you guidance as to the amount of resistance you’ve applied. This can be annoying when you want to return to previous setting as you’ll need to estimate the level you want by feel. The resistance pad is guarded by a shield to prevent sweat from dropping on the flywheel and pad so it is not damaged from the water and salt in the seat. This helps to increase the longevity of the pad. Depending on how long and often you use the bike you should get up to 12 months usage from the pad before it needs replacing. It can be sourced from the supplier for a few dollars. The chain drive system provides a riding experience similar to the one you experience when riding a bike. It works the same way. This does mean that there will be maintenance required and it will make some noise too. The maintenance is likely to be less than outdoor bike as you’re not riding in the wet or over bumps in the road but involves lubricating and tightening the chain as required. There is a chain guard that encloses the chain. This keeps sweat and dirt away from the chain to prevent them damaging it. It also helps reduce the noise further and prevent clothing and your ankles from getting caught up in the chain. It has a fixed gear so there is no coasting allowed. The heavy flywheel’s momentum will continue to keep the pedals moving when you stop pedaling so to stop them turning when you want to do this you need to either gently reduce the speed or use the emergency brake. You do need to be careful, if you are new to these bikes to ensure you are careful to prevent any type of injury. The emergency brake is activated by pushing down on the tension knob which pushes the resistance pad hard on to flywheel and quickly stops it turning. The Spinner Blade has dual pedals to fit SPD and normal athletic shoes. You can clip on to the pedals with your cleats quickly to grip the pedals hard or if you don’t have them you can slip your athletic shoes into the toe basket and tighten the strap to get a good secure hold on the pedal. If you don’t like the pedals or have your own bike pedals you can remove the pedals that come with the bike and replace them with your preferred ones. The cranks the pedals screw into them are durable and strong to take the weight of the user without any flexing. There should be no concern with pedals or cranks that they will break or shear when you are up out of the saddle pushing hard. Seat. The seat is designed for comfort when you move around on it to prevent too much pressure on your sit bones but you may not find it to your liking. As with all bike seats what is comfortable is down to the individual. The good news is that you can replace it if it is too painful to bear with a standard bike fitting seat. You also could try padded bike shorts or a gel seat cover too. Handlebars. You can use the handlebars in multi positions in particular the 3 spinning position of in the center, at shoulder width and at the end of the bars. It doesn’t come with aero bars. The handlebars are covered for comfort and better grip especially when hands get wet from sweat. Noise. This isn’t a silent bike but it is quiet. You’ll hear the chain making a low clinking noise as it moves over the sprockets and a quiet shushing sound from the resistance pad rubbing against the flywheel. It is unlikely to disturb others in the house when you are spinning or training. If noise is likely to be an issue the quieter bikes have magnetic resistance and belt drives. The quietest bike in this price range is the Keiser M3 plus but you may find the riding experience not as smooth, much less like riding a bike and, more like you get with exercise bike styles. Dust and Dirt. The bike doesn’t generate a lot of dust and dirt. But there will be some as the resistance pad wears down and lubricant dropping from it too from time to time. Also you may drop sweat on the bike and floor. These things can damage your floor but this can be prevented by putting the bike on a rubber mat. The bike can be quickly stored out of the way when not in use. It has 2 small wheels at the front that you tip the bike on to so you can move the bike without having to worry too much about its 126 lbs weight. The wheels work well on hard floors and carpet as the wheels shouldn’t get jammed due to being fully exposed. When moving the bike be careful of wood floors as the wheels may dent or scratch it. It requires an area of 56.5 ins by 21 ins for storing, so doesn’t take up much room. The bike comes partially assembled. From unpacking the box to completed assembled it should take about 60 minutes in total. The tools required for assembly are included and the instructions for this are adequate. There isn’t anything technical required and most people find it a simple process. It is a matter of adding on the stabilizer bars, pedals, seat, handlebars and adjustment poles. The most difficult part is likely to be holding the bike in place while you attach the stabilizer bars due to the weight of the bike. It weighs 126 lbs when assembled. You may want someone to hold the bike for you while you bolt the stabilizers into place. The bike does not come with a console. You can add a Spinner one if you want to keep track of your workouts and have the feedback to keep you motivated. Some people purchase a bike computer such as Cateye and fix them to their spin bikes. It does require you modifying the spoke magnet to fit the flywheel. As well as keeping track of your performance it can help with your cadence. Not everyone wants a computer to do this for them and they use the music on a workout DVD to keep their cadence at the right level and their motivation up. The other important measure is your heart rate to help you train in your heart rate zone for the most effective workout for you. The alternative to a bike computer here is to use a heart rate strap and monitor to keep you in the zone. If you want a bike that comes with a computer that has a lot of similar features the Ironman X-Class 510 Indoor Training Cycle is worth considering – it doesn’t come with spinning DVD but you do get a rubber mat for putting the bike on. The bikes comes with a water bottle holder and 4 Spinning DVDs. Spin bikes don’t usually come with much in the way of accessories and this bike is slightly better with the inclusion of the DVDs. The water bottle holder is a dual one located between the handlebars. This makes it easy to access your water when you ride. The bottles are kept in place by gravity which means you just need to grab the bottle as there is no need to slide it in to place. They are good size so should fit just about any size bottle. 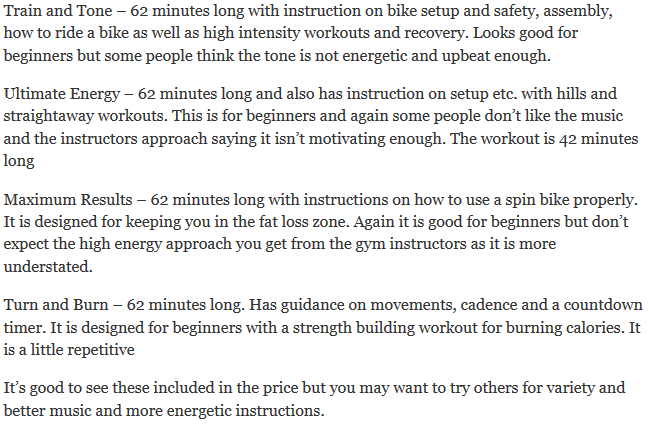 It also comes good with instructions for beginners on setting up and using the bike. The customer reviews for the bike are very positive. They like the quality of the build. One customer mentions that it is the best spin bike they own – they have 4 of them. They like its durability and it is ease of use. The only slight negative mentioned in one of the reviews is that it was noisier than expected but it is only mentioned the once, so most people find the bike relatively quiet and suitable for home use. The bike has a durable construction. weighted flywheel, dual pedals and damage resistant paint that should mean this bike looks and works great for many years with minimal maintenance required. It has been manufactured to be a commercial grade bike so can take a lot of punishment. At Amazon when I checked it was available through Prime and could be shipped for free. This bike is suitable for all levels of experience from beginner to advanced. 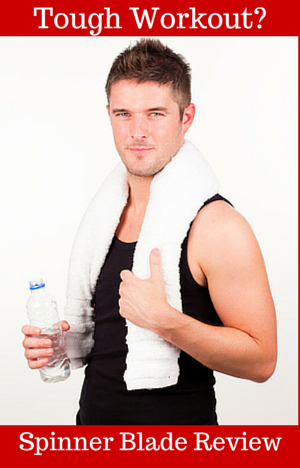 It provides you with everything you need for quality workouts and training. Personally I’d like to see it come with a console as standard for motivation and tracking workouts but not everyone want them. For beginners, with the price over $1500 it may seem a little pricey but that depends on your intended use and how often you are going to use it. It is something that can cope with the changing needs as you get experience and become a stronger spinner or rider but if you are unsure you maybe better suited with one of the spin bikes for beginners until you build up fitness and commitment. This is a well constructed bike that is durable and holds you steady while you workout at any intensity. It should last for years with it being built to commercial standards. Like the detail in the review helped me take a decesion. Thanks. It’s great to hear that the review helped you. Regards, Paul.